In slow cooker, place roast. In small bowl, combine gravy mix and water. Mix well. Pour mixture over roast. Cover. Cook on low 8 to 10 hours. During the last hour of cooking, in a small bowl, combine 1 1/2 tablespoon corn starch with 1/4 cup cold water. Mix well. Add corn starch mixture to slow cooker. Cover. Cook remaining hour. Makes 8 servings. Serve beef between two slices of bread with gravy drizzled over top, if desired. Hot Beef's are typically served with mashed potatoes. I like to have mine with French Fries and the rich beefy gravy poured over top. Our son Tyler, with our foreign exchange daughters. We have two foreign exchange students living with us. To help them feel at home, I have been fixing a lot of rice and Asian style dishes. The other day the girls asked me to fix typical American recipes, so for the next few weeks that is what I will be doing. I grew up in Iowa, home of the Hot Beef. In Des Moines, we would go to a little cafe that made the best Hot Beef's in town. The cafe was nothing special on the outside, but the food was so good, that there was always a line of people waiting to get in. This recipe is a family favorite. It is one of my mom's recipes and it is even better than that little cafe in Iowa. Mine and Miki loved the Hot Beef's, they gave it two thumbs up! The sponge you use in the kitchen, is the most common place to find dangerous bacteria. 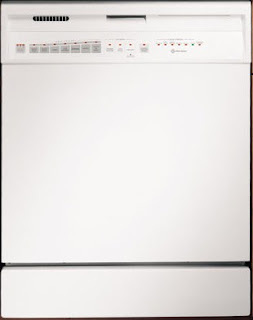 The combination of moister and food partials, make a perfect breeding ground for bacteria. 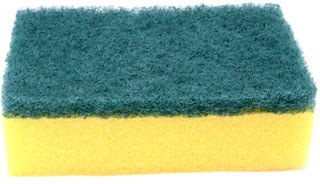 An easy way to disinfect the sponge, is to microwave the damp sponge for 1 minute. 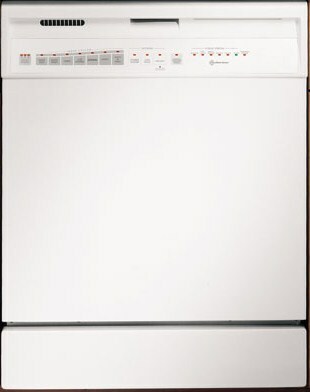 Or place the sponge in the dishwasher and run it through the longest cycle setting. Slow Cooker Hot Beef recipe. Cook tortellini according to package directions. Drain. Set aside. In large skillet, heat oil over medium high heat. Add vegetables. Cook fresh vegetables 3 to 5 minutes or frozen vegetables 7 to 8 minutes, or until crisp tender. Add tortellini and stir-fry sauce. Toss to coat. Heat through. Garnish with cashews. 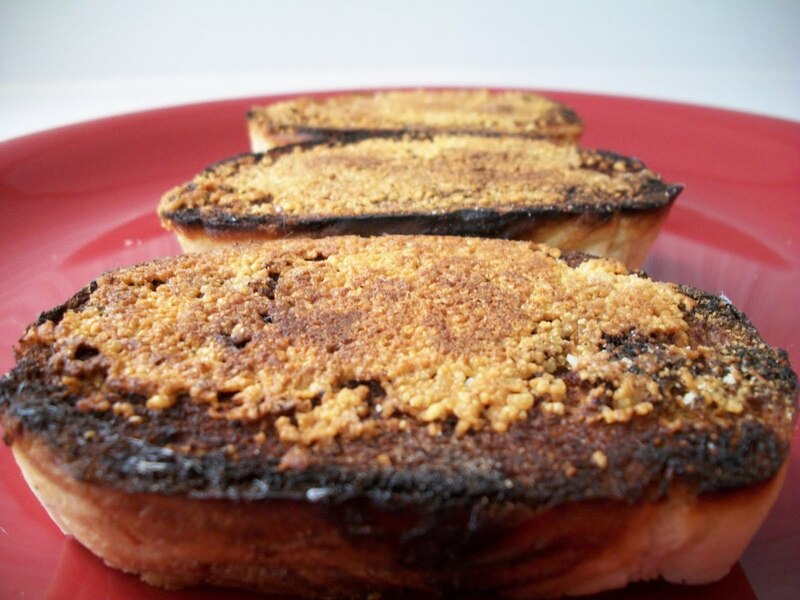 This is one of our son Tyler's favorite recipes. It is a fun twist to an Asian style dinner. The peanut stir-fry sauce coats the vegetables with delicious slightly spicy flavor that encourages you to eat them. You can find the peanut sauce in the Asian food isle. 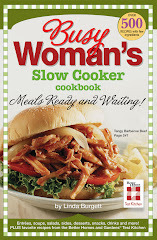 A special thank you to Melynda of Mom's Sunday Cafe, for posting a link to my Slow Cooker Honey BBQ Ham recipe! 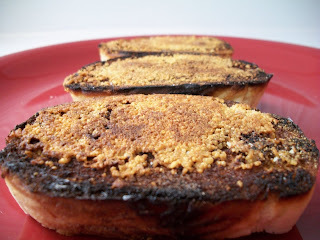 Stop by her blog and check out all the other recipes she has posted links to. 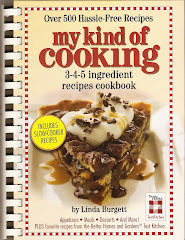 My friend Diane of My Life in the Charente, posted a blog about winning my cookbooks. Please stop by her blog and check it out. You will love it; she takes fantastic pictures! Thank you Christine, of Cristine's Pantry for posting my Orange Twist Cake! Please visit Christine's wonderful blog! When I made my Orange Twist Cake last week, I went to my trusty toothpick holder, only to find it empty. I searched the cupboards, and there was not a toothpick in sight. Oh no, what to do! I always insert a toothpick in the center of my cake, just like my mom had taught me too. Then I remembered, my mom would use a strand of uncooked spaghetti when she found the box of toothpicks empty. She would insert it just like it was a toothpick, and if it came out clean or with a couple of crumbs, the cake was done. This little trick really worked! Thanks again, Mom! I have been beyond busy the last couple of weeks. I am the Executive Producer for Passion Play Ministries International. It is a drama ministry that is in 15 cities around the world. This last week we trained groups from three new cities and did further training with an existing city. I trained people on how to paint the sets and make and apply special effects make-up. 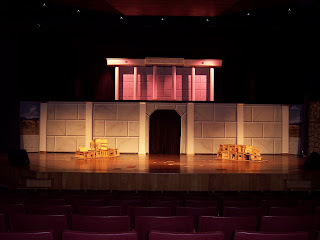 The set for scene one. Music video with scenes from the play. Preheat oven to 350 degrees. In large bowl, pour 1 can mandarin oranges with juice. Drain remaining can of oranges, add to bowl. Add cake mix, eggs, and oil. Mix well. Pour batter into greased 13x9 inch baking pan. Bake 35 to 40 minutes. Cool. Frost with cream cheese frosting or whipped topping. This cake is what we are having for dessert on Easter. It is moist and has a very light orange flavor. Have you ever thought about quitting blogging? I hadn't until this last week. This is my favorite time of the year, and my busiest time of the year. Aside from being busy, I had some really disappointing news delivered this week. So feeling discouraged and overwhelmed, I considered quitting. Just when I was getting serious about giving up the blog, I went to my friend Bo's blog. On Bo's Bowl, he had made and posted my Pretzel Toffee recipe, and just like that, the little cloud of sadness that had been hanging over me every since I received the bad news, seemed to lift. Bo's kind words were just the encouragement I needed. Is there someone you know who needs a few kind words? I know I was praying for something to happen to make me feel better, and I am sure if we all look around we will find people who need a little encouragement too! A very special THANK YOU to Christine of Cristine's Pantry for giving me a Food Blog Award! Please visit Christine's wonderful blog; she has a Coconut Fried Chicken recipe that I can't wait to try! In large bowl, combine all ingredients. Mix well. Cover. Refrigerate 2 hours or overnight before serving. Why is it that when your Mom make your favorite recipe, it is always better than you can make it yourself? This bean salad recipe is one of my favorites! My Mom will only make it when I am home. It doesn't matter how much my sister Shelley begs and pleads for this dish, my Mom refuses to make it until I am there. Have you ever put eggs in a pan of water on the stove to boil, then got busy and forgot you did it? I am sad to say I have, and unfortunate I have done it more than once. Luckily for me, my Mom purchased me an egg cooker, and saved me from potentially burning down my house with my forgetfulness. and forgot about it, or is it just me? I want to say Thank You to Jessica, of cajunlicious for the award she gave me! Please check out her fantastic blog! In slow cooker sprayed with non-stick cooking spray, place ham. In small bowl, combine honey, barbecue sauce and brown sugar. Mix well. Pour mixture over ham. Arrange pineapple over and around ham. Cover. Cook on low 4 to 5 hours for a fully cooked ham and 7 to 8 hours for an uncooked ham. Ham is traditional for the Easter dinner, so that is what is on the menu at our house. We love this recipe! The ham is tender and juicy with a delicious sweet and tangy sauce. I can put it in the slow cooker, go to church, and when I get home, I can have dinner on the table in a matter of minutes. This Easter I have two slow cookers doing the work for me. In the first slow cooker is the ham of course, and in the second one is my Extra Cheesy Hash Browns. I would typically serve my Mom's baked Mac & Cheese recipe, but our foreign exchange girls love the Hash Browns and asked me to fix that instead. What are you cooking up for Easter Dinner? 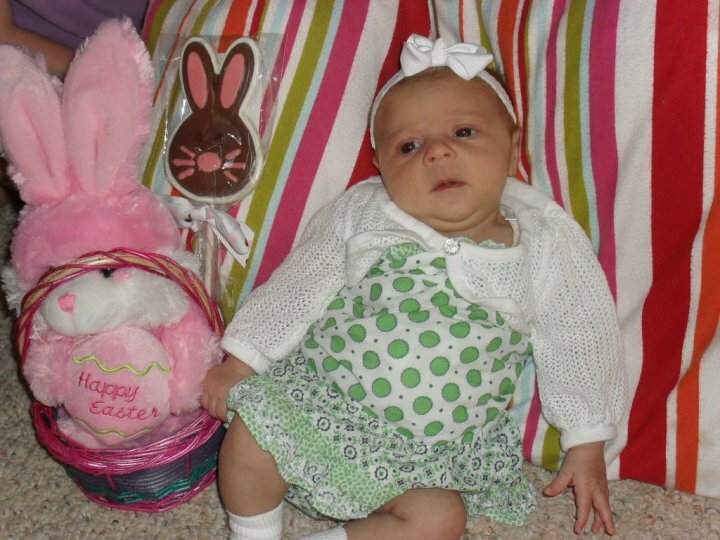 Does your family have special Easter holiday traditions? to see more recipes that are on my Easter menu. 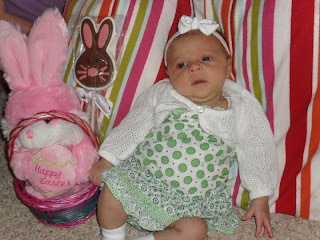 My niece Calli, last year on Easter morning. Does the thought of a big Easter dinner leave you feeling tired and stressed, even before the day arrives? With a little planning, you can enjoy a good dinner and the company of your loved ones. 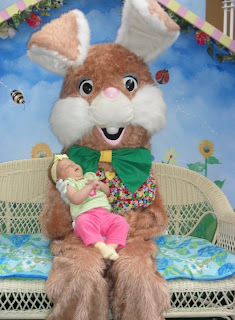 Below are a few tips that I use to help me sleep like a baby in the Easter Bunny's arms, instead of tossing and turning, worrying about getting everything done in time. 1. Clean as you go. This is the first kitchen tip my mom taught me, and it is one I use everyday. Click this link to read the post: "Clean as you go!" 2. KISS: Keep It Super Simple. Save that new complicated recipe for another time. Instead use tried and true recipes that you know everyone loves. Each member of my family has a favorite recipe that our mom will only make when we are at home for dinner. It make each of us feel very special and encourages us to get home as much as possible to have that special treat. Next week I will post the special recipe that my mom only makes for me. 3. Share the load. Have each guest bring a dish. Create a menu and assign each guest a specific item to bring. It wouldn't be much of a dinner if everyone brought the same dish. You can only eat so much cake. 4. Prepare ahead. Do as much as you can the night before. Desserts, veggie trays, marinades, and deviled eggs, are just a few of the dishes that can be made ahead of time. 5. Use slow cookers. They free up space in your oven and keep your kitchen cool. You can cook almost everything in them. What tips do you have for a hassle-free holiday meal? joy that should come with this Easter season! Honey BBQ Slow Cooker Ham recipe. In blender container, combine jalapeno peppers, onion, cilantro, and 1/2 of tomatoes. Cover. Blend well. Add remaining ingredients. Cover. Pulse until blended. We eat a lot of salsa at our house, and it is not just because we live in New Mexico, it is because we love it! This recipe is one of our favorites. You can customize the heat in the salsa by adding the peppers to the blender at the end, tasting after every addition, until you arrive at the desired heat. When the fresh tomatoes are looking a little on the not so tasty side, there is no need to fear; thanks to canned tomatoes you can have salsa any time of the year. Our grocery store sells fresh jalapeno peppers all year long. If you can't find fresh jalapenos in your store, you can substitute canned diced jalapenos. 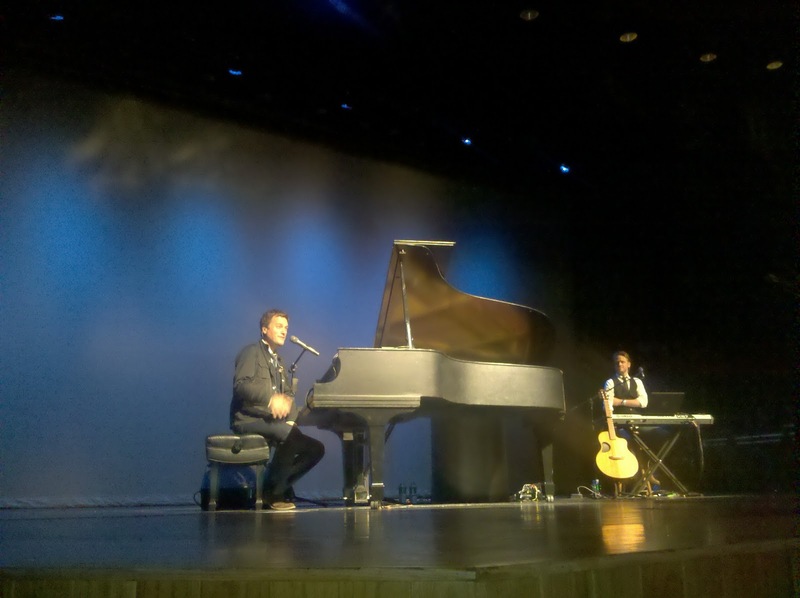 Last Sunday the Passion Radio Network, where I have my "Fast Food Friday's" show and where I co-host an afternoon drive time show called, "Cross Connection" with my husband Stan, had Michael W. Smith in concert. It was an incredible concert! He not only played his new songs, but he also played some of my old favorite songs like, "Friends are Friends Forever". 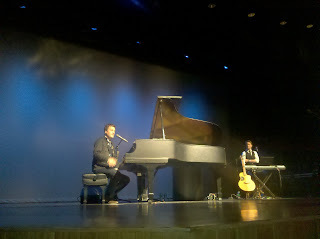 Michael W. Smith with my cookbook. Michael W. Smith and his crew had dinner before the concert. I prepared the above Restaurant Salsa recipe, my Mediterranean Salsa, and my Caramel Banana Trifle for them. All three recipes were a big hit. A special thank you to Melynda of Mom's Sunday Cafe, for posting my Pretzel Toffee recipe! 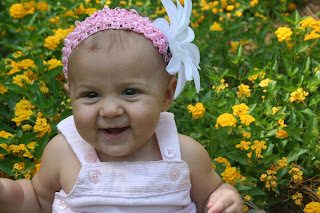 Please check out her fantastic blog, you will be happy you did!